Authors and artists have long imagined otherworldly libraries – magical libraries, mythical libraries, libraries of a distant past, future or planet. There’s Star Wars' Great Jedi Library – an enormous stronghold of knowledge and a symbol of the Jedi. In Lord of the Rings, Gandalf learns about inscription on the One Ring in the dusty library of Minas Tirith. Or think of the Doctor Who episode in which the Doctor and his companion visit the largest library in the universe in the 51st century – an entire planet – and find it eerily deserted. These imaginary libraries are testament to the undeniably magical and complex quality of libraries – the particular quality that silent stretches of volumes have, categorised and ready to offer up innumerable secrets. Or, indeed, they demonstrate how the plenitude of the library can make it a mysterious secret itself, resistant to decoding or ordering. But the library as we know it is under threat – and so these fictional places have never been more relevant. One day, libraries may themselves be consigned to fiction. Funding has a large part to do with this – just look at the trend away from local libraries and towards regional hubs. But digitisation is obviously also a major factor. Terry Pratchett imagined a labyrinthine library in Discworld overseen by an orangutan where students occasionally get lost and are forced to eat their own boots to survive. 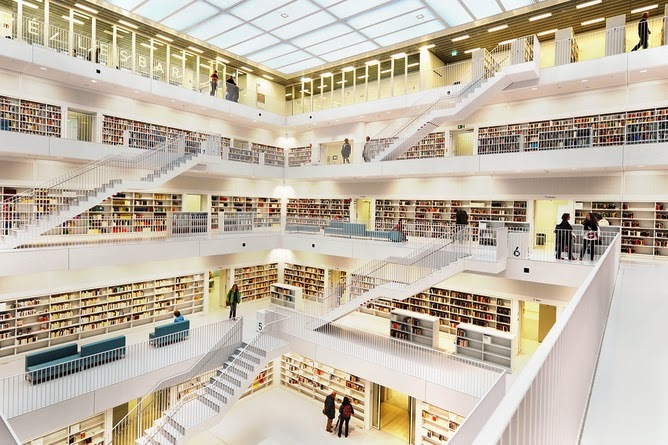 It may sound absurd, but this is perhaps the library that is most immediately relevant to today – with its endless shelves and connections to every library and every collection of books in the Multiverse. The emerging contours of the digital landscape may mean that the end of the library as a repository for books is inevitable. A few clicks are all it takes to access a library larger than the imagination can conceive. We have access to millions of books without ever having to leave our homes. Available through a dizzying amount of providers, times have never been better for voracious readers. Books, new and old, are freely available (if you have internet access, of course) – whether through Project Gutenberg (46,000), the Internet Archive (7.8m) or Google Books (30m). And, of course, that’s not counting the books, both free and paid, available through Amazon’s Kindle Store (3.2m) and Apple’s iBooks Store (2.5m). These, surely, are the libraries of the future (or, indeed, of the present). Our old idea of the library was of a space (as large as the Library of Congress, as small as the cosiest of branch libraries). The library is now also to be found as a virtual space built of ones-and-zeroes, a magical library of almost unimaginable proportions that can also be distilled into increasingly smaller portable devices, such as Kindles, Kobos, Tabs, iPads and iPhones. The future library is bigger than all the world’s historical libraries combined, and smaller than a book on one of those libraries’ shelves. Such a thing has only previously been conceived of in fiction. The Library is unlimited and cyclical. If an eternal traveller were to cross it in any direction, after centuries he would see that the same volumes were repeated in the same disorder (which, thus repeated, would be an order: the Order). Borges’s library promises order but reveals disorder: repetition shows that order and chaos are ultimately the same thing. This rings true today. Isn’t part of the problem that all the orderliness suggested by that digital library of ones-and-zeroes is actually filled with a chaotic Babel comprising millions of books, of which we can no longer make any sense? We’re now in a labyrinth, rather than a library: a space where anything goes, where the reliable tactility of the book has evaporated. The library is no longer a space that we can reliably perceive and compute, but a vast abstraction that has more in common with the boundless night sky than any terrestrial architecture. And what of the traditional role of librarians as custodians and mediators, initiating uncertain or curious patrons into the mysteries of the stacks? What about the simple power of browsing, of walking through those stacks and discovering serendipitously that magical book at your fingertips? According to Jacqui Grainger, Manager of Rare Books and Special Collections at University of Sydney, these fears and fantasies need some qualifying. In the age of mass digitisation, the librarian’s role continues to be central, particular in recording vital historical information about the books being digitised. They have the perfect skills for building and managing digital resources, and curating collections is not so different digitally than physically – availability and access is still mediated. Browsing is never as magical as it might appear. And the Library of the Future and its custodians are manifesting themselves in the real world in other intriguing ways. In the winter of 2014, the Moscow metro started making copies of Russian classics available for free download as e-books to its patrons. Travellers on public transport are typically seen book-in-hand, so it makes perfect sense for network providers to connect them not only to their destinations but to their reading. If libraries are as much spaces as they are collections of books, then perhaps the Moscow metro is transforming itself into one. Despite the various attempts to preserve our cultural legacy intact for future generations, the future facing libraries can seem rather apocalyptic. In H G Wells’s The Time Machine (1895), the protagonist travels forward to the year 802,701 to find an Earth where humanity has dwindled into the childlike Eloi and the cannibalistic Morlocks. To judge from the size of the place, this Palace of Green Porcelain had … possibly historical galleries; it might be, even a library! And who knows whether the future of the library might lie in ruins. Or perhaps the library will transform, phoenix-like, into something completely unexpected and magical once again?